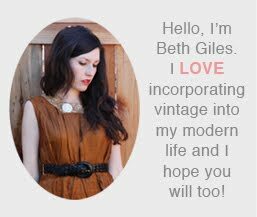 I have been replacing a lot of "new" or newer things in my home lately with older things and I thought this concept could make for a good blog posting series. I just love the quality and style of older things so much more, but sometimes you just have to live with what you have. For example, this oak table was handed down to us by my parents when we got married and we have moved it from two different apartments into our current home. It hasn't really gone with our decor for awhile, but it served it's purpose. 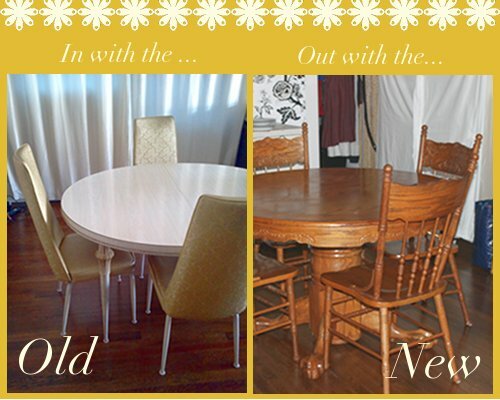 When I found this white vintage table and chair set at a local antique store, I knew it was time to say goodbye. Luckily, my brother is getting married, so I passed it on to him. i love this look beth! and i like your saying, "In with the Old, Out with the new" :) so good. Love love the old! Great chairs~! The Old seems to be a better fit than the New! I really like the sset!